I own a quilt shop in Archers Rest, a small town on the Hudson River in New York State. It was small and crowded and probably a bit of a mess until my granddaughter, Nell Fitzgerald, moved to town. Recovering from a broken engagement and looking for a new life, she decided we had to renovate Someday Quilts… expand the shop, add new classes, send out a newsletter, go online… the whole nine yards. Not that I’m not grateful. It does look nice and we’ve attracted lots of new quilters to the place, but Nell has a way of getting in the middle of things. She…how do I say this? She has almost as strong a personality as I do. Which is usually a good thing. She’s a smart, creative, and involved young woman. If someone needs help, Nell is the first to offer a hand. I’m proud of her interest in other people, and of the way she’s made Archers Rest her home. In fact, I couldn’t be a happier grandmother. Except with this murder business. That scares me. I had a nice, quiet quilt group that met once a week to eat cookies, share their latest quilt projects, and offer a tidbit or two about the happenings in town. We minded our own business, and maybe in our own way, we minded everyone else’s as well. But quietly. Not Nell. She moved to town just before the local handyman was unfortunately murdered in my shop. Poor boy. And Nell jumped in with ideas, theories, clues and…. Before I knew it, she’d solved his murder! There was no stopping her after that. We have more than our share of suspicious deaths in Archers Rest (especially since Nell moved to town), and there’s been a fire, a few thefts, even a shooting on Main Street. And my granddaughter is right in the center of it. Every time! And now, so is the entire quilt group. The ladies range from 28 to 75, retired librarians to former beauty queens… and each one imagines herself a modern day Miss Marple. We hardly have time to talk quilting anymore, with so much of our energies devoted to solving the latest crime to hit town. I thought once Nell got involved with Jesse Dewalt, our chief of police, she would let go of her dangerous hobby and focus herself on art school, her work here at my shop, and making quilts, but it hasn’t worked out that way. Nell thinks that hunting after a killer is just as fun as finding the right fabric for a quilt. When I tried to point out that the two did not go together, she reminded me of something I used to tell her when she was a child. She tells me that her patchwork quilt of life includes solving crimes. It scares me, even when I find myself involved in helping her. But I think she’s right. Given all that’s changed in her life, and mine, since she moved to town I have to step back and see the richness her friendship has added to my patchwork quilt of life, in ways I would never have expected. So, what do you have in your life that makes it feel like a scrap quilt – the interests that don’t seem to go together but somehow, wonderfully, do? 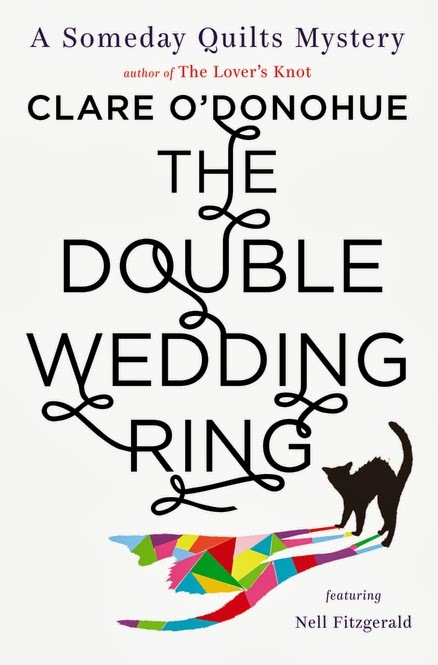 The Double Ring Wedding Quilt will be in stores on September 24. Visit Clare at her website, twitter and facebook. I know what you mean. I quilt and own Batty About Quilts. The people in my life are like the patches in a quilt, too--all different. What a great story, thanks for sharing. And a great analogy too. A stepdaughter should never have fit in my life, but somehow, she does.